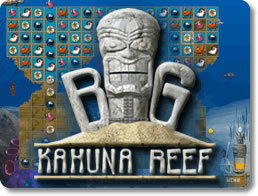 Big Kahuna Reef Game - Download and Play Free Version! Match Cool Undersea Shapes to Fill in the Game Board! 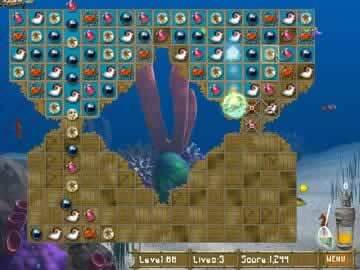 After each puzzle level you solve, you earn points toward adding a new fish to your reef. View your reef between levels and enjoy the fish you add to it. Each fish comes with a snippet of information to help you learn more about it. New to Big Kahuna Reef are locked spaces on the board. You must match these up with two other shapes before the space can be unlocked. Often the locked spaces block more of the board that must be eventually filled in. Other additions to the game include varying board shapes to give the levels variety, the ability to take away shapes that are hard to match, and the necessity on some levels to fill in spaces more than once. 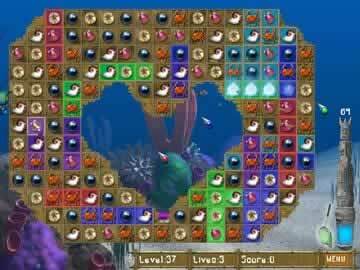 Anyone who has enjoyed the fun puzzle play of Bejeweled or Jewel Quest need to give Big Kahuna Reef a try right away!